Wheels is the master of life hacks. Give him a challenge and he’ll figure out how to solve a problem with what’s on hand, make square pegs fit in round holes and get things done faster and better. When we decided to add a wreath to each front window on our two story house during the Christmas season, that became another challenge. 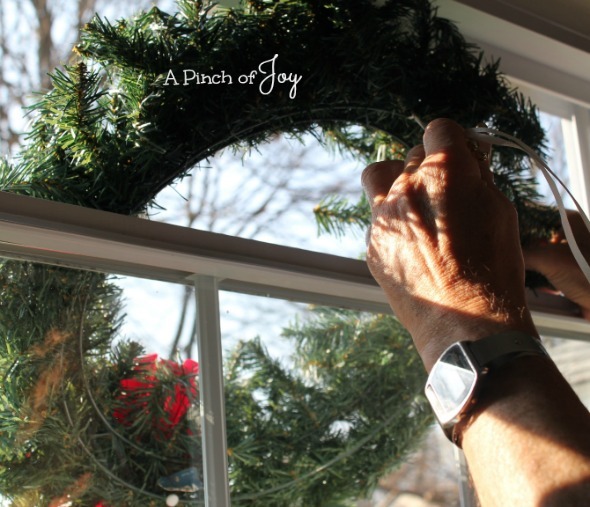 How to hang a wreath securely with minimal tools in the least amount of time possible? His solution means it takes him ten minutes to hang all the wreaths each year. And that includes going to the garage attic to get them. Here’s the secret of his simple solution! It uses curling ribbon and an old bead garland. You could replace the curling ribbon with anything similar but it must be strong and thin. Strong to hold the weight of the wreath in a side wind. 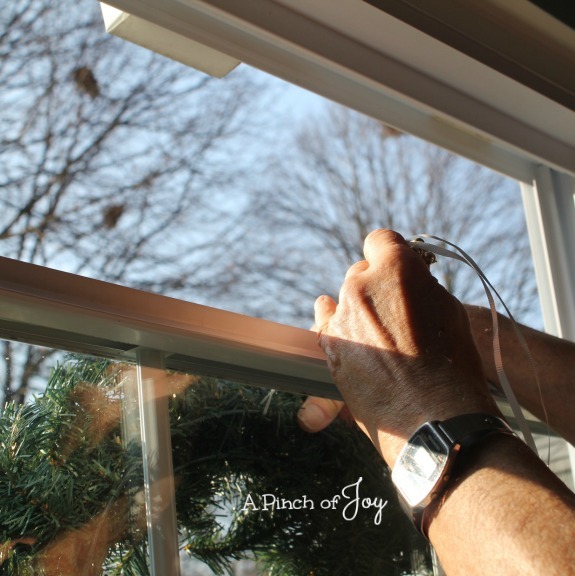 Thin so it will not disrupt the tight seal between your window and the window frame. You could replace the bead garland chunk with anything large enough to keep the ribbon from slipping through. A large bead would do. Not too big since you want it to be not so noticeable on the inside of the window. Since we were doing this on the spur of the moment, Wheels used what was on hand. He experimented a bit to determine the correct placement of the beads on the ribbon. He decided to keep the wreaths on a short leash so they wouldn’t run away in the wind. Yes, he does talk that way. But that’s another story for another day! In other words, hang them near the top of the window so winter wind can’t easily pick wreaths up and bang them against the glass. Or a sneaky side wind slip under a long tether and break it, blowing the wreaths away completely. Open the top sash of the window. Our windows are double hung so the top slides down. This would also work on windows that are opened with a crank. 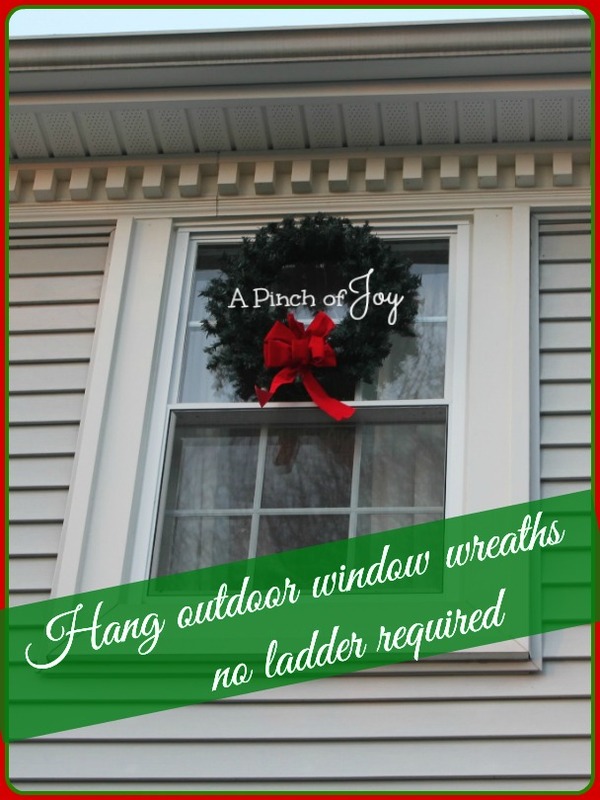 Or any other window that allows you access to the outside and lets you position the wreath on the top of the window frame. 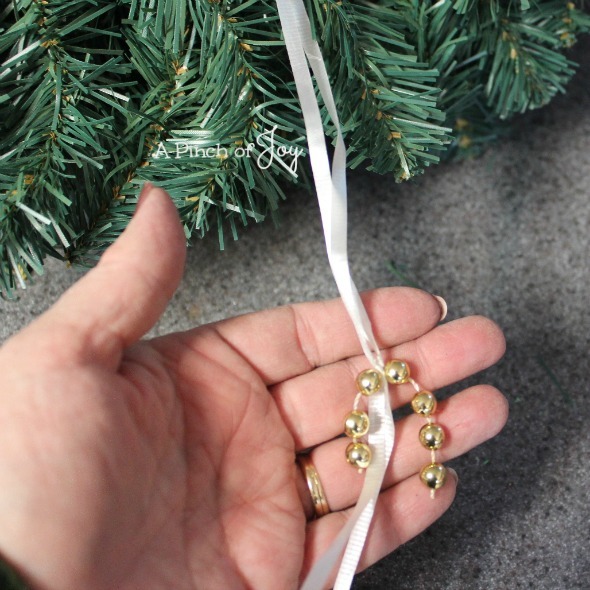 Hold the beads firmly in one hand and move the wreath into place with the other. Still firmly grasping the beads, close and lock the window. I’m so glad you stopped by today! Be sure to follow A Pinch of Joy so you don’t miss a thing! Subscribe by email on the sidebar or follow on Facebook, RSS feed, bloglovin’ twitter and check out my pinterest boards. If you found this helpful or inspiring please share below! 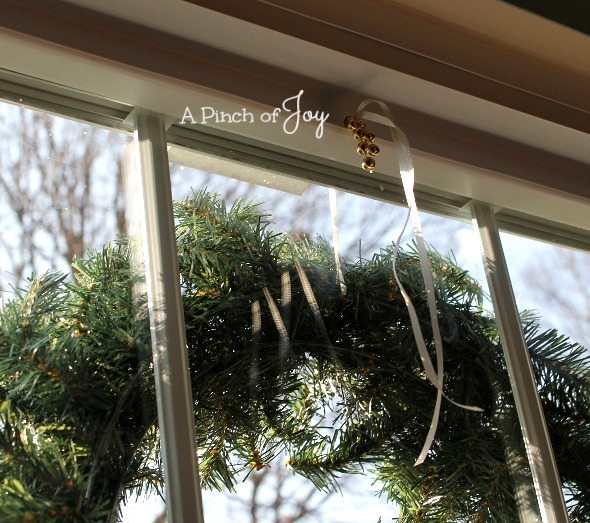 Your support of A Pinch of Joy is appreciated!